IN JULY 2014, the newly formed National Democratic Alliance government took a decision which did not attract much attention but is likely to have far reaching consequences. It decided to phase out procuring rice from millers for its public distribution shops. To run the world’s largest public distribution system (PDS) for foodgrains, the government procures rice through two mechanisms—customed miller rice (CMR) policy and levy rice policy. Under the first system, the government buys paddy directly from farmers at a minimum support price (MSP) and gives it to millers for extracting rice. Under levy rice policy, the procurement is through local rice millers who buy paddy from farmers at MSP. As per the levy rice policy, millers are allowed to sell a certain percentage of rice in the market, the rest being procured by the government. The quantity allowed to be sold in the open market varies from 25 per cent to 75 per cent in different states. The decision means that farmers would be able to sell paddy either to government procurement centres or to the market. Farmers and activists have criticised the decision, saying selling paddy to procurement centres is not always feasible because they are often non-functional or located at far-off places. The option of selling it to millers at MSP gave a security which this decision will take away, they add. The government argues that the move would strengthen the rice market and help farmers in the longer run. It will also save thousands of crores of rupees. “Our assessment is that we can save nearly Rs 4,000 crore to Rs 5,000 crore spent on procurement, storage and movement of rice,” says Hans. According to government figures, nearly 30 per cent of total procurement of rice in the country is done under the levy policy. This comes to 8-10 million tonnes of rice. This stock will now most likely flood the market where it will sell at a rate below MSP. The decision will affect erstwhile undivided Andhra Pradesh and Uttar Pradesh more than other states because the share of rice procured by them under levy policy is 75 per cent and 60 per cent respectively. Sources say the Andhra Pradesh chief minister has already lodged a protest with the Centre against the decision. The decision will have a bigger impact on farmers of states where the market price of paddy is much lower than MSP. These include Uttar Pradesh, Andhra Pradesh, Bihar, Maharashtra, Odisha and West Bengal. “In Uttar Pradesh, the market price of paddy is Rs 800-Rs 900 per 100 kg, much lower than MSP of around Rs 1,400 per 100 kg this year. The decision will hit small farmers who are not able to access procurement centres,” says a senior Uttar Pradesh government officer on condition of anonymity. 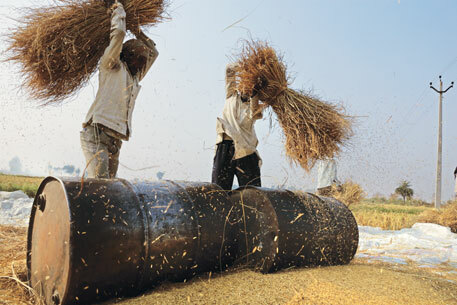 Procurement of paddy from farmers is done through 14,000 procurement centres in the country. Experts say it is an open secret that a vast number of purchasing centres do not function. “In Uttar Pradesh, procurement was quite low in the past two years because many purchasing centres were non-functional,” says a Food Corporation of India (FCI) official, requesting anonymity. According to FCI, the state collected around 2.3 million tonnes of rice in 2012-13 which was one million tonne less than its collection in the previous year. Procurement centres also face charges of corruption. They delay the procurement process by 30-50 days to make small farmers, who do not have the resources to store paddy, sell it at a reduced rate to local traders. “These centres function well in Haryana and Punjab where farmer lobbies are strong but not in other states,” says Yudhaveer Singh, convener of Bhartiya Kisan Union. The move is also likely to encourage adulteration. It will provide millers the opportunity of mixing the paddy they get for rice extraction for PDS with that of low quality. This would ultimately affect PDS consumers who will get substandard rice. Another problem associated with procurement centres is their locations which keeps changing almost every year. The 70th round of the National Sample Survey Office (NSSO) report, published in December 2014, says only about 25 per cent of agricultural households are aware of government purchasing centres in their area and about 30 per cent are aware of MSP, but only 13 per cent actually go to procurement centres. “The decision shows that the government is indirectly asking farmers to sell their grains in the market at market price,” says Biraj Patnaik, a Delhi-based food rights activist. The indications of the government’s decision were visible soon after it came to power last year. In June 2014, it asked states not to purchase grains from farmers at a rate higher than MSP and warned that FCI would not procure grains from states who do so. Experts say that in the past couple of years, the government had procured more rice than it needed to run PDS. This is the reason the current government wants to clear the stock. But clearing the stock can harm food security, says Ramanjyuvlu GV from non-profit Centre for Sustainable Agriculture in Hyderabad. “The buffer stock of procured rice would finish by next year because the National Food Security Act, 2013, which guarantees rice at cheap rate to 830 million people, would result in an increased consumption. Thereafter, the government will have to start procuring rice from the market instead of farmers,” he says. However, the decision has received support from experts who favour open market. The move, they say, will ensure that farmers get paid the price their produce deserves. Ashok Gulati, former chairperson of the Commission for Agriculture Cost and Prices, a government-appointed commission that recommends MSP, says, “The concept of levy rice reminds one of the socialist era. We should welcome the government decision. Let the farmers and the consumers have the freedom to access grains without any hurdles,” he says. “I feel it is a good move, but the government should also ensure better infrastructure at procurement centres,” says Devendra Chouhan, general manager, Food Corporation of India, Uttar Pradesh. Farmers, however, are not convinced of the perceived benefits of the decision. Prashant Kumar, who cultivates paddy in his 6 ha field in Uttar Pradesh’s Bijnor district, says the decision would help big farmers like him because he has more bargaining power and can sell rice in the open market. “But it would adversely affect small farmers who benefit more from the levy rice policy,” he says. Farmers like Kumar are a minority. NSSO data saysabout 80 per cent of farmers in the country have small land holdings of less than 0.4 hectare.